Acrohnabacility.info is the PUP that uses misleading techniques to prevent removal. Use Reimage to locate malicious components and get rid of them faster than with uninstall instructions. A full system scan blocks virus reappearance and prevents traffic to malicious domains. Acrohnabacility.info - adware which modifies the browser's homepage, causes dubious redirecting, and displays a huge amount of intrusive adverts. Acrohnabacility.info is an ad-supported application that performs unwanted changes in the infected web browsers and tries to benefit from advertising. If you are infected with this adware program, you might experience intrusive pop-ups while you are using web browsers such as Google Chrome, Mozilla Firefox, Internet Explorer, Microsoft Edge, Safari, etc. However, annoying advertising is not the only unpleasant activity this potentially unwanted application performs. Acrohnabacility.info virus might not be dangerous itself but its ability to redirect users to developer-sponsored pages might result in landing on a malicious website. If such a thing happens, the risk of getting infected with malware increases slightly. Note that there is no need of keeping this rogue app on your PC, so keep on reading and gain knowledge in adware removal methods. Google Chrome, Microsoft Edge, Mozilla Firefox, Internet Explorer, etc. Frequent advertising, redirecting, unnoticed browser changes, browser struggles, etc. web browsers are operating slower than before due to the increased amount of advertisements. 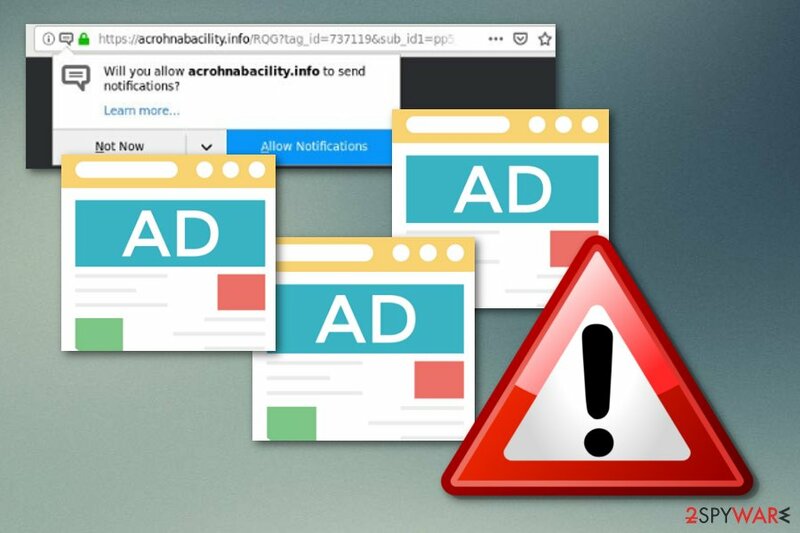 Note that Acrohnabacility.info pop-up ads can become extremely bothering and annoying if you do not take actions and deal with the adware program fast. If you keep this potentially unwanted application, the number of ads will only increase and cause browser struggles, slowdowns, or even crashes from time to time. Make sure that the adware app does not stay long on your computer after you spot the first symptoms signaling about the PUP infection. You can remove Acrohnabacility.info virus by using a reliable computer fixing tool. This software is created to lengthen the elimination process and complete it faster. Furthermore, make sure that all unwanted components were successfully removed. We recommend using a computer tool such as Reimage which is able to find all rogue content that might be hiding in the system. Talking about the Acrohnabacility.info removal, note that it is necessary if you want to avoid secret data collection. What this potentially unwanted program does is collecting browsing history details to generate beneficial advertising posts. 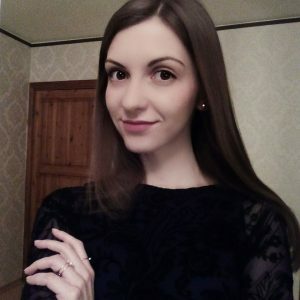 Once this type of information is collected, developers start creating advertisements (pop-ups, pop-unders, banners, sales' coupons) which rely on the gathered data. The developers of Acrohnabacility.info have been trying to create ads that look attractive to the user. Sometimes these advertisements might try to trick the victim and convince him/her to buy completely unnecessary software or services. Be careful if you see adware posts promoting computer fixing tools, system optimizers, and other similar products. This is very likely to be just a scam used to trick gullible users and empty their pockets. Acrohnabacility.info is an adware program which enters the computer by using deceptive techniques such as bundling. According to cybersecurity experts from the NoVirus.uk website, potentially unwanted applications are widely distributed together with other free or shared programs. You might accidentally skip some installing steps and download your wanted software together with a PUP. For this not to happen, you should choose the Custom or Advanced installation mode which allows you to track all of your downloads and opt-out the software and its components you do not want to install. Moreover, having a reputable antivirus program will definitely increase your computer's protection and safety. Antivirus software needs to be kept updated in order to work correctly. If you take good care of the tool, it will truly help you with your PC's protection. This type of software is able to detect various system-related vulnerabilities, find any rogue content in the computer, perform regular system scans, and even wipe out all the trash. Adware programs require quick removal as they do not bring any good effects to the computer but just overfill it with annoying advertising posts. Remove Acrohnabacility.info virus from your infected web browsers including Microsoft Edge, Google Chrome, Mozilla Firefox, Internet Explorer, or Safari. You can use anti-malware tools which will speed up the process and deal with the cyber threat in a couple of minutes. Acrohnabacility.info removal can also be performed manually. If you are likely to get rid of the potentially unwanted application on your own, check out our below-given instructions which should help you to complete the process. Make sure that you cautiously refresh web browsers and remove all unwanted extensions, plug-ins, and add-ons from all of them, otherwise, the adware program will not be completely removed and it is only a matter of time when it will renew its activity. Here, look for Acrohnabacility.info or any other recently installed suspicious programs. When in the new window, check Delete personal settings and select Reset again to complete Acrohnabacility.info removal. Once these steps are finished, Acrohnabacility.info should be removed from your Microsoft Edge browser. Here, select Acrohnabacility.info and other questionable plugins. Click Remove to delete these entries. Now you will see Reset Firefox to its default state message with Reset Firefox button. Click this button for several times and complete Acrohnabacility.info removal. Here, select Acrohnabacility.info and other malicious plugins and select trash icon to delete these entries. Click Reset to confirm this action and complete Acrohnabacility.info removal. Here, select Extensions and look for Acrohnabacility.info or other suspicious entries. Click on the Uninstall button to get rid each of them. Now you will see a detailed dialog window filled with reset options. All of those options are usually checked, but you can specify which of them you want to reset. 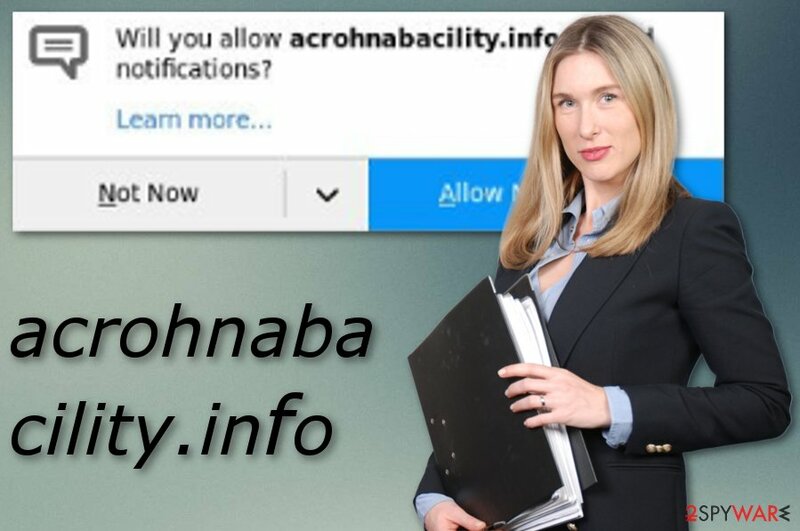 Click the Reset button to complete Acrohnabacility.info removal process. ^ What is malware and how can we prevent it?. Norton. By Symantec. Internet Security info. ^ NoVirus.uk. NoVirus. Cybersecurity news page. This entry was posted on 2018-11-28 at 06:40 and is filed under Adware, Viruses. You can quickly scan the QR code with your mobile device and have Acrohnabacility.info manual removal instructions right in your pocket. How did you remove Acrohnabacility.info?